American landscape painter Frederic Edwin Church was born on May 4, 1826 in Hartford, Connecticut. 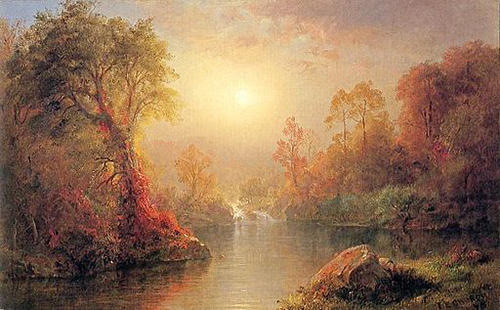 He was a very important artist in the Hudson River School of American landscape painters. Frederic Church was highly popular for his huge panoramic landscapes, with subjects such as sunsets, waterfalls and mountains. At times he also painted natural phenomena that he witnessed during his travels, often depicting dramatic scenes that focused on light with a touch of the romantic in its natural detail. Frederic Edwin Church was the son of Joseph Church, a banker and jeweler in Hartford. He was instrumental in having Frederic study under Thomas Cole, a respected and notable landscape artist of the 19th century, through his persuasion of a neighbor, Daniel Wadsworth. He was the founder of Wadsworth Athenaeum, the gallery where Church sold his first major painting. Samuel Church, Frederic’s grandfather was a silversmith and founder of the first paper mill in Lee, Massachusetts. Frederic Church became Cole’s pupil from 1844 to 1846 at the artist’s studio in Catskill, New York. He often accompanied his teacher on painting trips in the Berkshires in Massachusetts and in the Catskill Mountains. His teacher described him at one point as having the world’s finest eye for drawings. After he finished his studies under Cole, Church established his own studio in the city of New York and quickly gained a reputation for his grand landscape compositions of various locales in New England and New York. He received further local and international recognition in 1857 when his seven-foot wide painting of the Niagara Falls, with its breadth and very close resemblance to the actual place, awed viewers in New York and Great Britain. Church was the only pupil that Thomas Cole had. Cole, who was British, moved to America and co-founded the Hudson River School with Asher Durand, who was a friend of his. It was the first American artistic movement that received acknowledgment. Church was a second generation follower of the Hudson River School, which was noted for their paintings that focused on traditional pastoral scenes in America. It was a style that tried to capture the wild yet true realism of America that was disappearing quickly. It was also a showcase of the feeling of appreciation for and discovery of natural beauty. While Thomas Cole often painted scenes that touched on allegory, Frederic Church chose to create majestic and natural scenes. His paintings, like his contemporaries, employed luminism, romanticism and far more than usual detail. Artists during the Romantic period usually depicted nature idealistically, showing its beauty and richness and for most of them, showed focus on nature’s grandeur. This was a tradition that showed in Church’s works, in his very detailed art, in the emphasis on low horizontal lines, the prevalence of the sky, while the technical skill is shown in luminism that was invented by Hudson River school. It tried to hide the brushstrokes for added realism and to minimize human intervention in the creation of the image, with an added emphasis on light. Searching for various landscapes that were more dramatic than what he’d previously seen led Church to make several trips to Europe, the Middle East and South America, including Labrador, Mexico, the Andes and Brazil. Increased use of metal color pigments allowed Church to create canvases with sharp and brighter colors, which were even more impactful that his previous works. One of the finest examples of this was the five feet by ten feet painting entitled “The Heart of the Andes” that he painted in 1859. It is now on permanent display at the Metropolitan Museum of Art in New York. He painted 202 large canvases throughout his career.